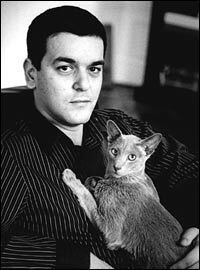 Has anyone else noticed that the cat sitting on his chest A) is posing for the picture like no cat has ever posed for a photographer before and B) looks exactly like the cat drawn in Sfar's book The Rabbi's Cat? * McNally Robinson Booksellers (50 Prince Street in Soho) on Monday, November 6th from 8:00 – 10:00pm. Sfar will share tales and images from his prolific body of work, including his new book Klezmer: Tales of the Wild East, followed by Q&A and book signing. The event is co-sponsored by the Cultural Services of the French Embassy. For more information call (212) 274-1160. That was yesterday. Know what else was yesterday? The kidlit drink night. Know where the kidlit drink night was held? You got it. Soho. So after a fabulous night o' schmoozing (I'll report in more detail tomorrow) and rice pudding, I high-tailed it over to McNally Robinson Booksellers. The store, by the way, is amazing. Great seating, amazing guests, and a truly impressive graphic novel section. The kicker is the children's literature portion, though. The store, being in New York and all, is not big. Yet their children's lit area has ALL the best books of 2006, even if it's just a copy each. My beloved Fly By Night was easy to find too, so I am now an official McNally Robinson Bookseller fan. Anyway, I got there too late to hear Mr. Sfar speak. I did, however, get a visual confirmation of francophone hotness. If you too would still like to see Mr. Sfar in person and you live in New York, Chicago, San Francisco, or Miami then you are in luck. It's a cross-country tour and y'all are the lucky cities he's visiting. Review of the Day: Probuditi!